Peanut butter and chocolate is a match made in heaven. After all, there is a reason why peanut butter and chocolate candy bars top the best seller list year in and year out! These Peanut Butter Brownie Bites offer a way to get your fix of these two favorites in a bite sized package. 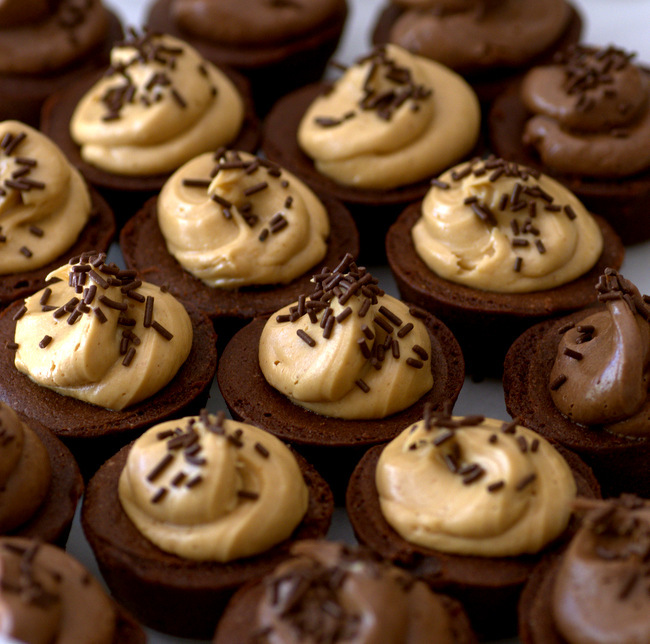 The individual brownies are baked in a mini muffin pan and topped with a swirl of peanut butter frosting. They’re almost too cute to eat – but they taste so good that I know you won’t hesitate once they’re in front of you! These brownie bites were inspired by the peanut butter frosting that I made the other day, as I prepared a double batch and had quite a bit leftover after frosting my cupcakes. The brownie batter comes together quickly and easily. I greased my mini muffin pans well and put the batter in without wrappers. The bites are fudgy in the center and slightly crisp around the edge, just like you want to see in a full sized batch of brownies. There is a little bit of peanut butter in the batter, but the peanut butter frosting on top is where most of the nutty, salty-sweet flavor comes from. The brownies are rich enough that you only need a small swirl of peanut butter to balance out each of these bites. The peanut butter buttercream is best made with a national brand of peanut butter (I used Jif), as the finished frosting will have a smooth, velvety texture with it. It is sweet, with a hint of salt, and a good peanut butter flavor. I wouldn’t hold it against you if you steal a spoonful (or two) out of the bowl as you’re frosting your brownies, because it is very hard to resist. You’ll notice in the picture above that I also made a chocolate version of the frosting by incorporating a tablespoon of unsweetened cocoa powder to a portion of the peanut butter frosting. While I liked the two-tone look on my dessert plate, I prefer the peanut butter only for maximum peanut butter flavor. I added some chocolate jimmies on top of the bites as a finishing touch, though chocolate shavings could be used to give them a more polished look and chopped, roasted peanuts could be added to give the bites more texture. The recipe makes a fairly large batch, but each bite is small, so you’ll work your way through these in no time at all. Preheat oven to 350F. Grease 30 mini muffin cups. In a medium microwave safe bowl, melt together butter and dark chocolate in the microwave, stirring occasionally. This should be done in 30-second intervals to avoid overcooking the mixture. Whisk in cocoa powder and peanut butter. Pour butter mixture into a large mixing bowl and stir in the sugar. Whisk in eggs, one at a time, followed by the salt and vanilla extract. Whisk in the all purpose flour and stir until flour is just incorporated and no streaks remain. Divide batter evenly into prepared muffin cups. They should be quite full. Bake for 14-16 minutes, until brownies are set on the top. Allow to cool completely in the pan. Once cooled, remove the brownies from the pan and swirl about 2 tbsp of peanut butter buttercream onto each one. Top with chocolate jimmies.